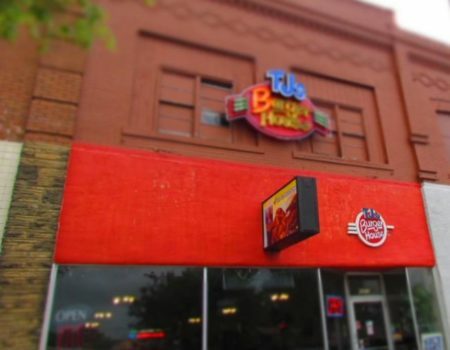 Our original research identified TJ’s Burger House as a good option for one of the locally-owned restaurants to visit. Sadly, time restraints forced us to cut it from our final list. When the day to head out arrived, unseasonably low temperatures in Wichita forced us to make a last minute itinerary change. We quickly reinserted TJ’s into the mix, and looked forward to our upcoming visit. TJ’s is your basic burger & fries style diner, and is decorated with a retro theme. 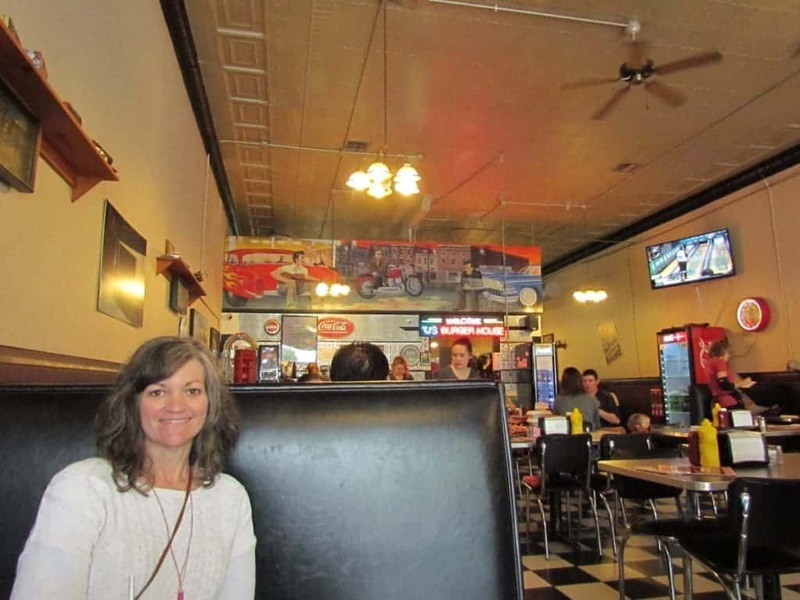 Checkered tile floors, vinyl booth seats, and plenty of 1950’s memorabilia brought the malt shop feel to our minds. 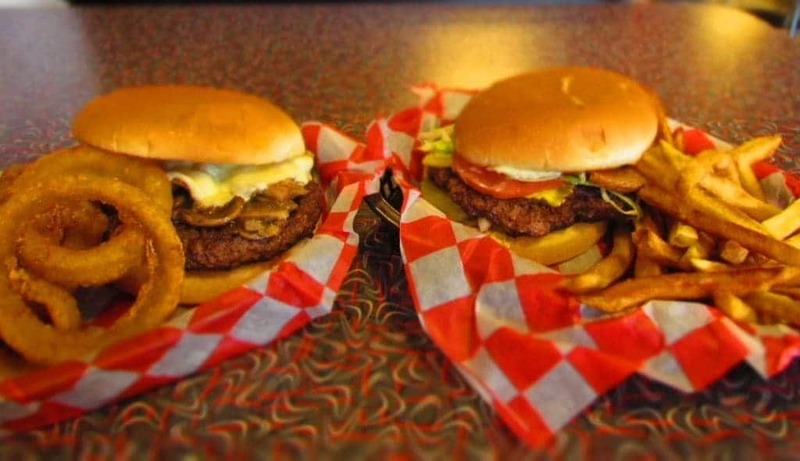 The reason it caught our eye was all of the buzz about their burgers. Now we aren’t saying we are burger experts, but we have tasted our fair share. We arrived on a Sunday about mid-day, and the place was already fairly busy. Some of the reviews I had read spoke about avoiding a weekend visit, due to long waits. While it did have a steady flow, we never saw people wait more than a couple of minutes for a table. We picked a booth, and settled in to check out the menu. This is where TJ’s separates themselves from other burger shacks. The menu is packed full of options. Wings, salads, and chili are good starters. A handful of chicken sandwiches are available, as well as B.L.T.’s, hot dogs, and some awesome looking baked potatoes. Of course, our research had set our minds on their burgers, but all of the dishes we were seeing at other tables made it hard to stick to our plan. Crystal went old school, and ordered the standard cheeseburger with fries. I decided to go with the Mushroom & Swiss burger, paired with the onion rings. Nowadays it is standard that a burger runs in the $5 to $7 range at most places, and at TJ’s this is also the case. What is unusual about this visit is that TJ’s burgers are 7 ounces AFTER cooking. To put it in perspective, a quarter-pounder is 4 ounces, so this burger is almost twice that size. For those brave souls, you can even make it a double. Of course, neither of us could even finish a single. We were both a little shocked at the weight of our sandwiches when we picked them up for the first time. From first bite it was obvious that these are not premade frozen patties. The beef is juicy and tender, and yes, very filling. Both of our sides were good, but we both seemed more stricken with the burgers. While we gave it a good try, we finally called it quits, and waddled out into the cool afternoon to start our exploration of the largest city in Kansas.